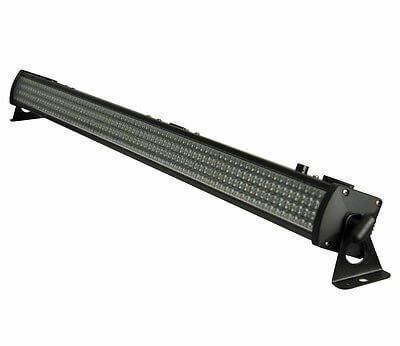 The Pulse LEDBAR 320 features eight segments and a total of 320 super bright, 10mm LED's offering greater output than the standard 252 LED products. Ideal for use indoors adding effects to stages, washing walls in colour or general up lighting. The Pulse LEDBAR 320 features eight segments and a total of 320 super bright, 10mm LED’s offering greater output than the standard 252 LED products. Ideal for use indoors adding effects to stages, washing walls in colour or general up lighting. The LED’s are split along the length of the bar in diagonal stripes to ensure a smooth wash across the wall without any hotspots from any of the colours.